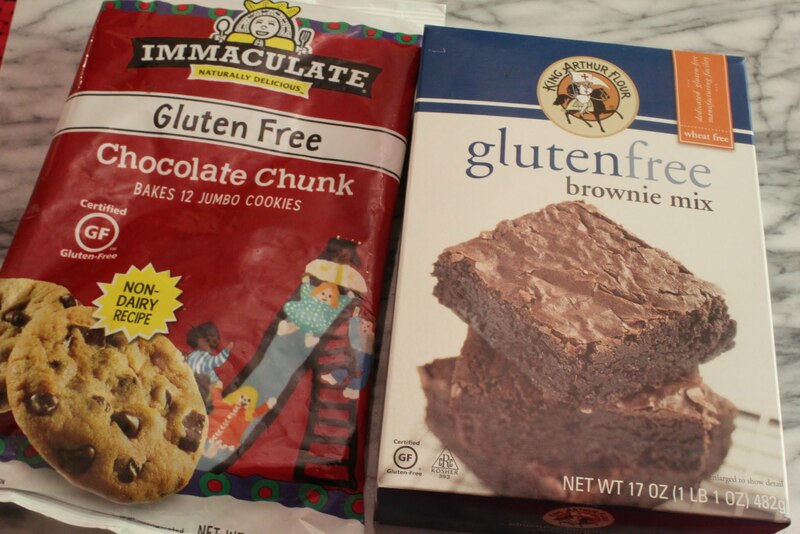 You take two fabulous gluten-free baking products, combine, and there you go! A dairy-free and easy project for the five minutes you have in the day to think before the next onslaught begins. It’s actually delicious. 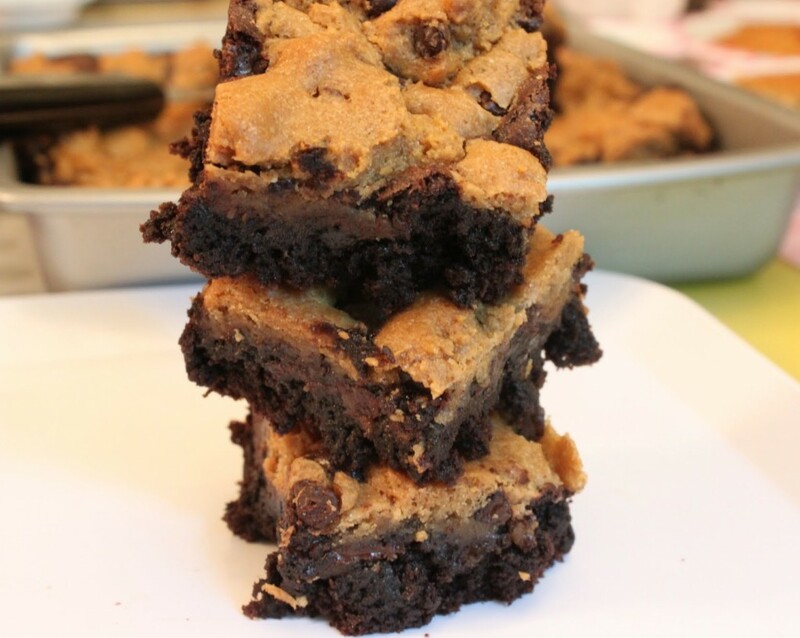 You give the brownies half of the baking time all alone, and then you pile on the cookie dough. It’s fab. And gluten-free folk everywhere will thank you! And to be honest, I made this as a preventive measure. I needed to stop my husband from snacking on the gluten-packed cookies and cream pie I made last week. He’s easily distracted. 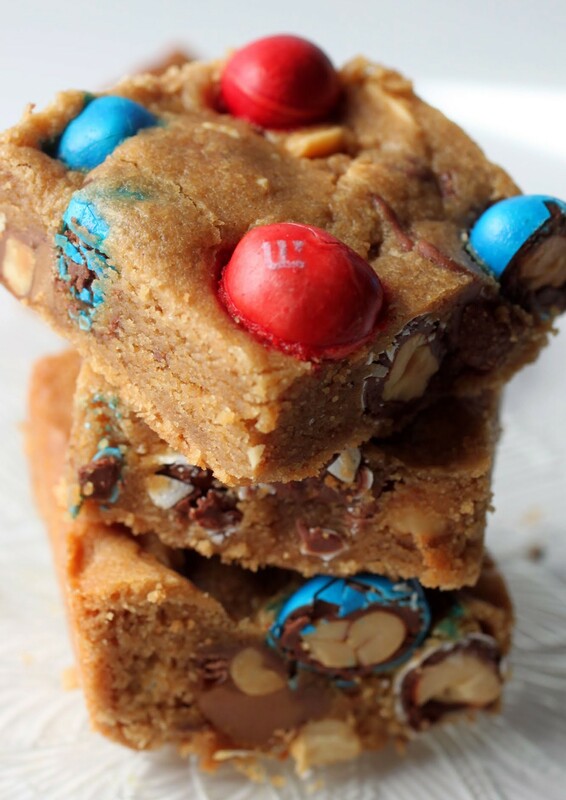 These are on the counter and quite appealing! And very good for his tummy. Simple recipe awaits! Eat a few while you ponder modern feminism, whether or not there’s a serious backlash going on, and how to change societal perceptions once you get past legal barriers. Fun times? Not so much. Eat instead! Make the brownie mix according to package directions and spread in the pan. Bake for 20 minutes. 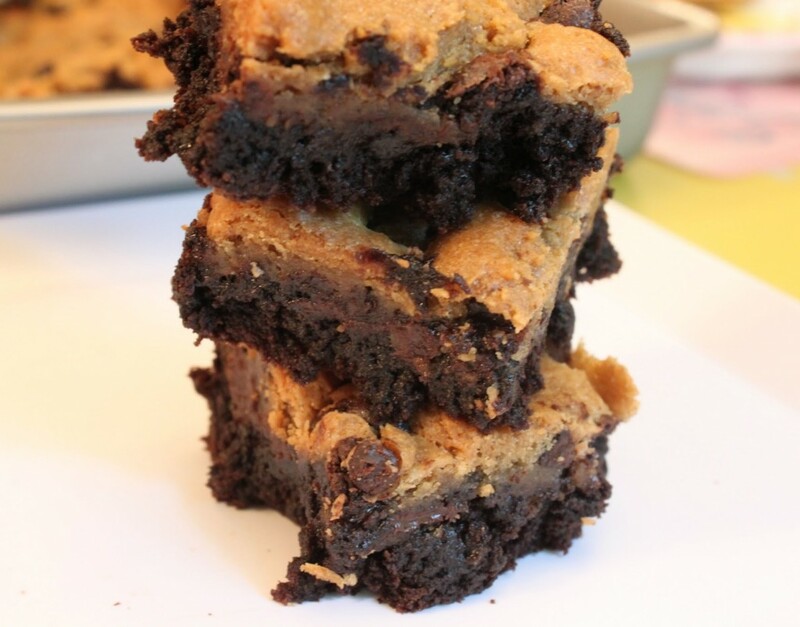 While the brownies are beginning to bake, take the dough out of the refrigerator. 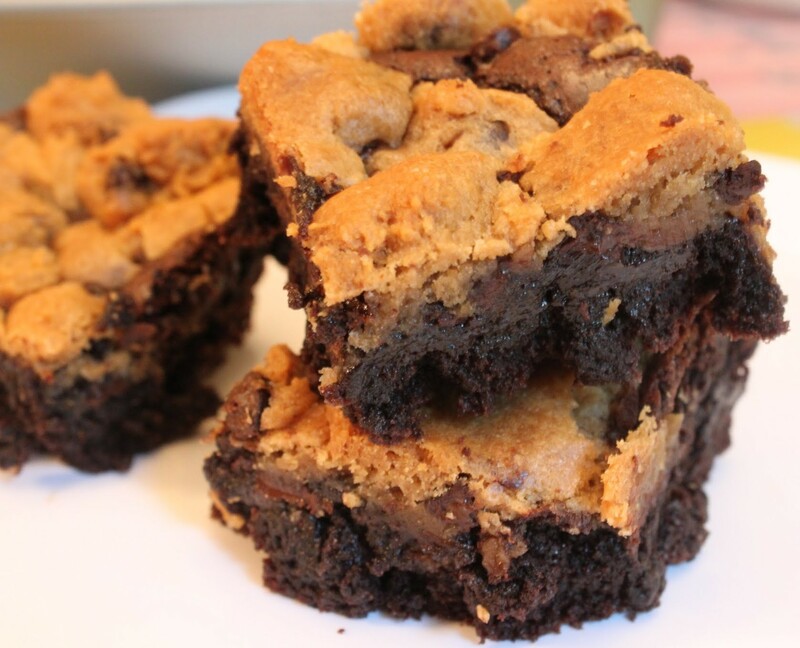 At the 20-minute mark, spread the cookie dough in flat chunks on the brownies and return to the oven. Bake for 25 minutes more until the top is browned and the center is only slightly jiggly. Bear in mind that gluten-free brownie mixes bake more slowly. Allow the bars to cool completely. Do not cut these warm, or you will be faced with a fudgy mess! Cut into squares and serve. Do you ever wake up with a crick in your neck? I never used to. I honestly never felt much pain at all in my now squandered youth. But these days, this persistent and quite literal pain in my neck just pops up most mornings and reminds me of my mortality. If I try to stretch it out or massage it, people just look at me funny. And since my mornings start with tons of students, it’s better to leave well enough alone. I’ve never gotten over a simple PB & J. I mean, how can you top that? With a bar, actually. That’s how you top the best sandwich ever. 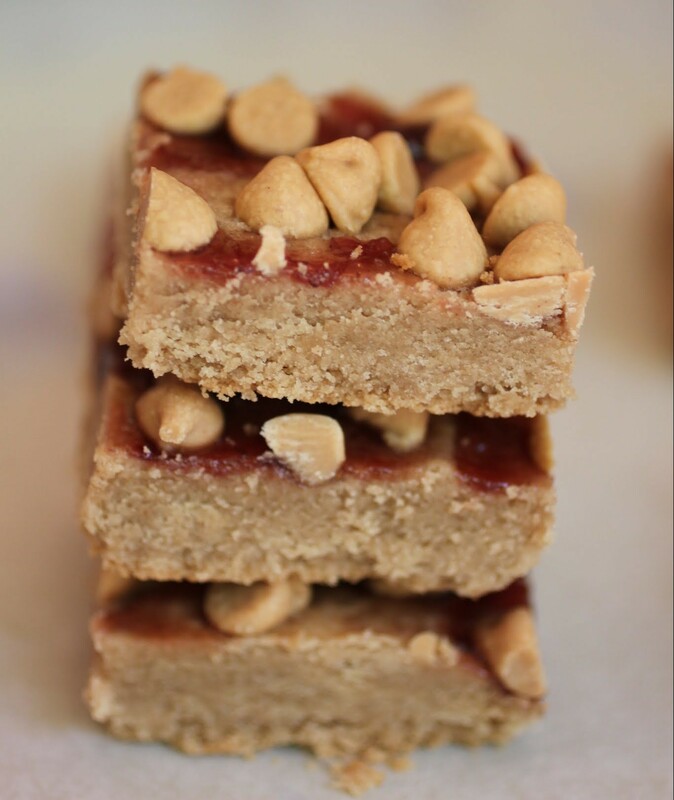 This bar is soft and chewy and topped with strawberry jelly. Oh, and peanut butter chips. Can you imagine what would have happened if your mother had put peanut butter chips in your sandwich when you were a kid? 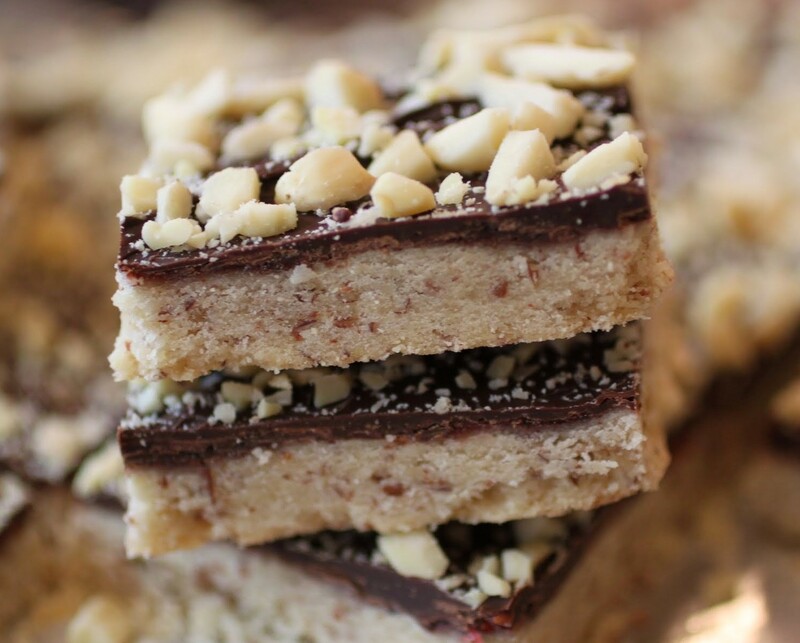 That’s known as “bad parenting.” But it works really well in a dessert bar! Too well, actually. These guys got banished to the freezer so I wouldn’t slam back the entire batch in one day. It makes me wonder why I didn’t name my blog after all things peanut butter. If you must know, I like to rename my blog in my head. But I still really like Just About Baked. These look delicious! Your husband is like a lucky guy (though it sounds like he could do a little more to help you out). I dunno, Jason. He’s too busy being hot and making up fake names and commenting on my blog. 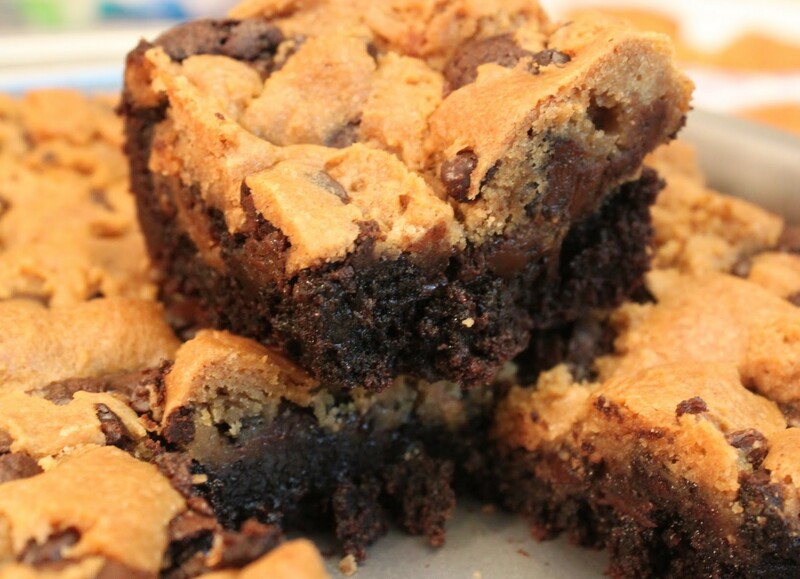 Anywho, back to these bars – I’m pretty cookie dough topped brownies are better energizers than any sports drink or bar. I think I could take on the world with a pan of these! (er, ok, maybe just my bed and pillows; all in a days work ya know) Love that they are GF and DF! Mary Frances recently posted…The Writing Process Blog Tour … all aboard! Yep. My husband is hilarious! Totally agree on the energy thing. Sugar is the best fuel ever, especially in chocolate chip cookie and brownie form! Your hubby’s comment gave me a good giggle! Totally something my guy would do!! 😉 These bars are fabulous! 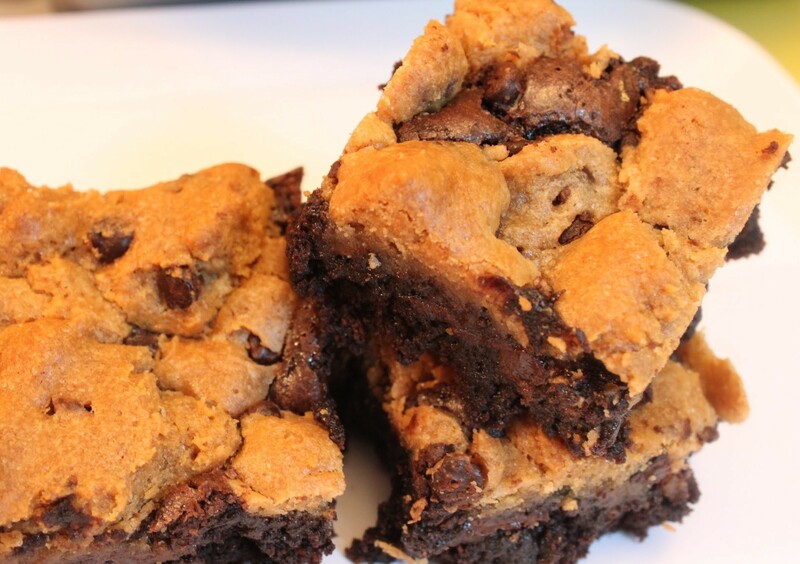 Love brownie and cookie together, yum! Husbands are funny! That’s why we keep them. 😉 Thanks! I baked this tonight. I’ll let you know how it tastes after Shabbos. It looks and smells good. I used a different brownie mix, so I adjusted the timing accordingly. Ha! Hope it turned out well!